The number of AICPA members is also a good indication. In 2015, there are more than 400,000 members in the organization. How Many Accountants are CPAs? While it is difficult to find out the number of CPA worldwide, we can estimate based on the data in the US. There are around 1.3 million US accountants according to the Bureau of Labor statistics. Depending on which assumption you use on the number of CPAs, we get a rough estimate that 30% to 50% of accountants are CPAs in the US. 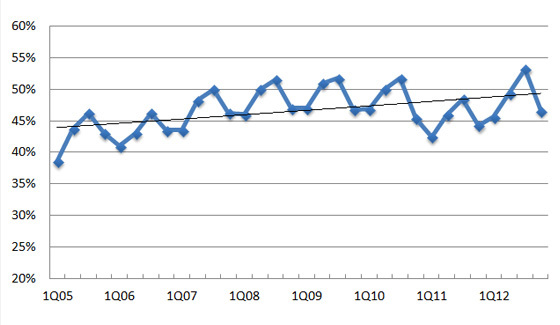 Based on the above data, the increase in the number of CPA is a meager 1% for 3 years. 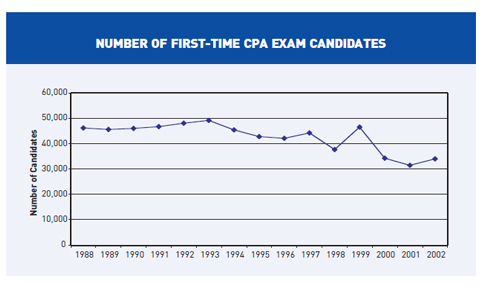 This is quite surprising given that the CPA exam pass rate is steadily increasing during this period. But an academic research by Professor Nicholas Schroeder and Diana Franz argue that the increase in the education requirement (the 150 semester hour) for CPA exam candidates may have been the primary cause of the declining number of college accounting majors and new CPA exam candidates. While the supply stays flat, the demand for accountants and particularly CPAs are increasing every year due to the recent new laws that address an improvement in financial integrity and scrutiny after the Enron bankruptcy in 2002 and the financial crisis in 2008. The U.S. Bureau of Labor Statistics projected in 2006 that the employment of accountants will grow by 10 to 20 percent over the next 7 years on a national basis. Every year, 8 to 10 thousand international candidates from more than 100 countries take the US CPA exam, representing roughly 10% of total candidate pool. If you are an accounting professional interested in this global qualification, there are lots of information for international candidates on this site. I appreciate the statistics represented here, however, I do find that the % of Accountant that are CPA’s is flawed. Using BLS data is probably the most accurate way to determine total number of accountant, the problem is that the total number of CPA’s includes many that are not Accountant’s. This would be something that is intrinsically hard to nail down on this scale, thus I do agree that this is probably the most accurate that’s possible, I just think the margin of error in this figure would be very wide.